That moment blew me away. I remember exactly where I was and what I was doing when it happened, which is pretty amazing, considering I barely paid attention to the rest of the show. It was on like Donkey Kong from there. I bought the LP, and I wore that bad boy out! Even the fold-out cover fascinated me. But even better than the packaging was the music. With the exception of “Baby Be Mine”, which I would argue is the ONLY B-side on the album, and “The Girl Is Mine”, every song was amazing. Even the non-released “Lady In My Life” is now a classic, and among my favorite songs of all time. While I enjoyed the more pop tracks on the album, including “Beat It” and “Wanna Be Startin’ Somethin'”, it was the R&B-leaning tracks that captured my impressionable musical attention. 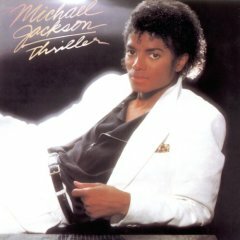 “Human Nature” and “PYT”, as well as “Lady In My Life”, were the heart of this record, and despite his attempts to capture that lightning in a bottle in following releases (I’d argue “Dangerous” was the R&B compensation to the pop leanings of “Bad”), he’s never hit the R&B trifecta again. So how did “Thriller” change my life? Well, I never looked at music the same way again, literally. The videos he created for this album were spectacular at the time, and raised the bar for the entire industry in the process. “Thriller” also helped bring out my R&B tendencies. Artists like Rene & Angela, the Dazz Band, Prince and Five Star would have had a much harder time hitting my radar if I hadn’t been prepared for them by the R&B influence of this record. More than anything, though, was a realization to I needed to be open to other types of music, and that has served me well over the years. Granted, I didn’t have to work at “Thriller”, since it was everywhere at the time. There is no such thing as a purely-born musical genre these days. Everything evolves from something else. And if you look at the last 25 years, I think you’ll find a lot of the music to come out of that timeframe evolved from “Thriller”. I’ll leave you with a live version of “Human Nature” from the Victory tour in 1984. No matter what you think of his stage presence, I doubt you can argue with the song being classified as a classic. I love stories like this – really puts the music into a different perspective and gives it a fresh appeal. Yay to your writing, yay to Thriller and yay to *that* dance still being virally broadcast all over the world! You would have never in a million, million years have thought that MJ would become the freakster that he is today when watching the Thriller vids. I totally agree he raised the bar with the video production and the stellar quality of the singles. I’m sure Quincy Jones had a lot to do with the magic of the album too. But I had a big ole laugh at your “on like Donkey Kong” line … priceless! donstuff, that was just downright freaky. Cool, but it would hurt my head to watch it again. Paul, I’m glad you enjoyed. I find it much easier to write these posts than the quick capsule posts, for some reason. Yuri, no kidding on the freak factor. It’s astonishing how radically he changed between the “Thriller” video and the cover of “‘Bad”. And the Donkey Kong line has “Yuri” written all over it.